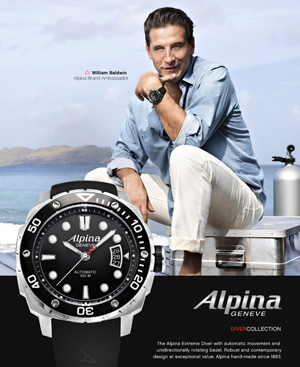 July 27 this year, the company Alpina introduced in New York extended the line of Extreme Diver Collection (base established in March of that year). “Face” of the new sports series became a famous actor William Baldwin (William Baldwin). As the company’s CEO Peter Stas ALPINA (Peter Stas), the company has long sought known person to support the emergence of a new collection. “William Baldwin – the most suitable candidate, he is cool and brave, fully shares the values of hour mark ALPINA». This is the new ambassador of the company presented the New York line of watches, created for water sports enthusiasts. Models Alpina Extreme Diver have cushion body size 44h44 mm, made of stainless steel. When creating a new diving lines were taken into account all the requirements for deep-time instrument – easy reading, a unidirectional rotating bezel, which serves to measure the time of immersion in water and of course, sealed enclosure. Thanks to the latter, watch is water resistant to a depth of 300 meters. Watch Alpina Extreme Diver on both sides are protected by strong sapphire glass. In deep water they are exposed to strong pressure, which resulted in often deform the basic elements of the case and case back. To avoid this, as the back cover was used by a thick sapphire crystal, refractory strain. Dial-matte-black, temporary indexes – overhead. The central arrow indicating the hours and minutes, covered with white fluorescent substance, providing readability indices in the dark and under water. In position “3” hours date indicator. Watches are designed on the basis of an automatic mechanism Sellita SW 200. Diving news comes on a black rubber strap with a buckle made of stainless steel, which allows you to lengthen the strap when putting on the sleeve of a diving suit. 10 copies of Extreme Diver Company donated fund The Carol M. Baldwin Breast Cancer Research Fund (created by the mother of William Baldwin – Baldwin, Carol (Carol M. Baldwin) to support research into the causes of breast cancer, its prevention, early detection and effective treatment). These hours will be on display at charity auctions as lots.